Alex Murfee from Woodward Academy looks relieved crossing the finish line in Race 2 at 15:54 What a HUGE Medal! There Back.....those Angoras from 2013 that had such a magnificent end to a dream season placing 2nd at State have taken up from where left off winning the team title in Race 2. Clarkston has reloaded and looks to be an immediate contender for the 5A title. Their 16:35 team average was probably better than Woodward's 16:30 earlier as the heat index had to be higher..Jr Abbas Akbahr led the charge placing 2nd in 16:03 and Gidey Sahlu crossed 7th in 16:17. Sam Bowie is now the man at Lagrange after Coggins graduated. Bowie announced his presence by taking the Race 2 overall title clocking a 15:59. 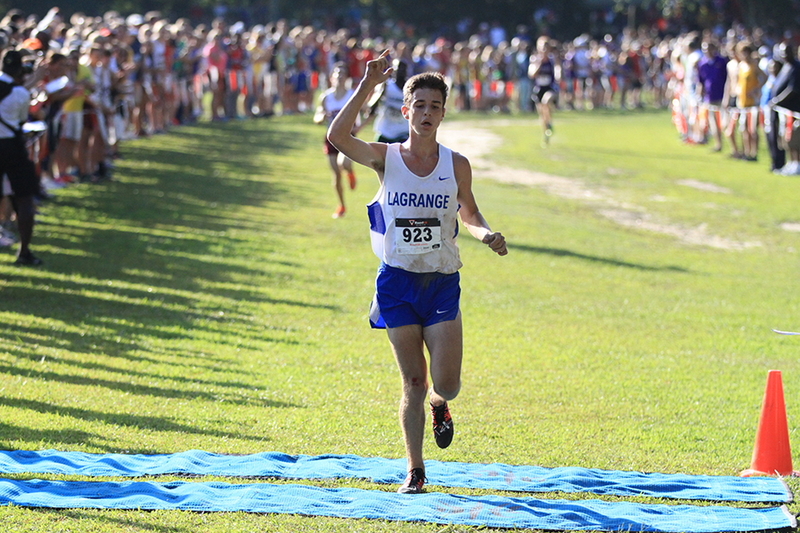 Filling out the top 5 were Jonathan Scwind of Lambert in 16:03.18, Davis Stockwell of Lakeside DK in 16:08 and Justin Weegar from Evans at 16:14. 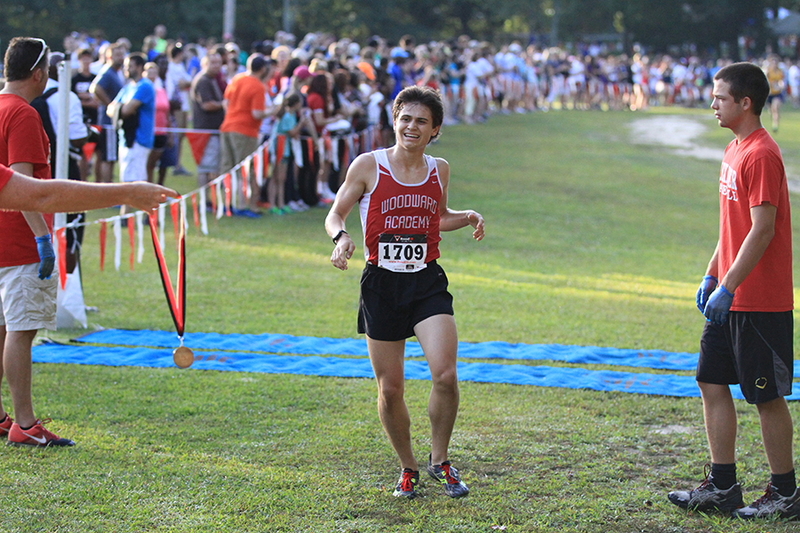 Forsyth Central ran well in their season debut placing 2nd in the team standings led by sr Austin Campbell in 16:15. In a rematch of last year's 3A Girls race, Blessed Trinity again upended a strong St.Pius X squad, but only by 11 points. The key was the Titans placing 3 runners in the top 10 including Mary Claire Solomon placing 3rd in 19:10. Riverwood International swept the top 2 individual spots led by race winner jr Anna Hayden (pictured) in 18:38 and soph Elizabeth Graves in 18:45. St.Pius and 5A McIntosh actually tied w/ 88 points but the Golden Lions secured 2nd on a 6th runner tiebreaker. Rebecca Entrekin led the way placing 4th in 19:40. Alyssa LeClaire led McIntosh's 3rd place effort placing 10th overall. 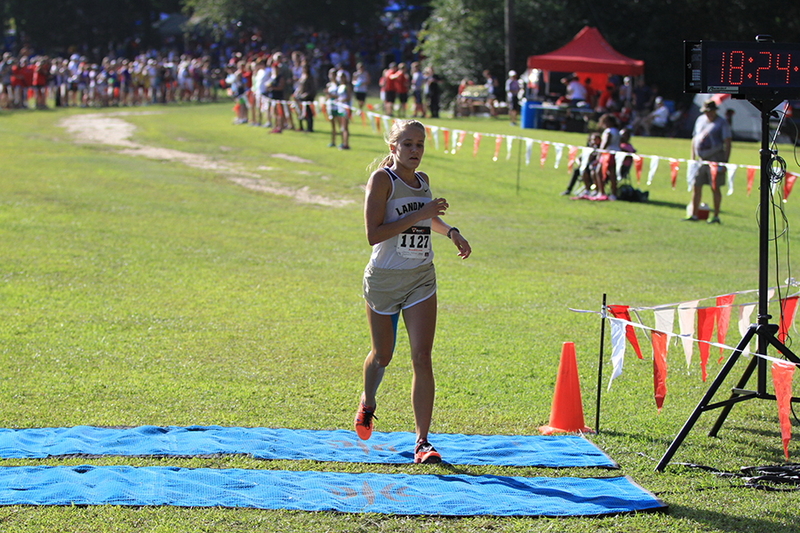 Kennedy THorne of Alpharetta took 5th overall in 19:45. 22 National Elites. 65 Elites.